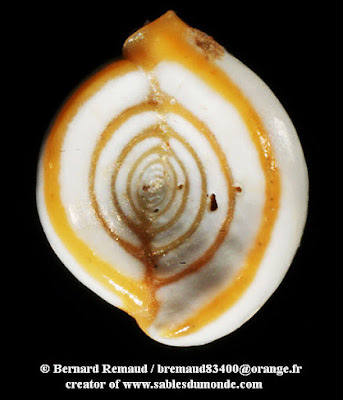 Spiroloculina excavata, copyright Bernard Remaud. Spiroloculina is a genus of porcelaneous Foraminifera known from the Upper Cretaceous to the present that is planispiral throughout development (Loeblich & Tappan 1964). Characters (from Loeblich & Tappan 1964): Test free, commonly with flattened sides and lanceolate or fusiform outline, earliest stage may consist of single chamber completely encircling proloculus, later chambers (or all chambers in megalospheric forms) being added two to whorl on alternate sides and in single plane; wall calcareous, porcelaneous; aperture at open end of final chamber, with simple or bifid tooth.